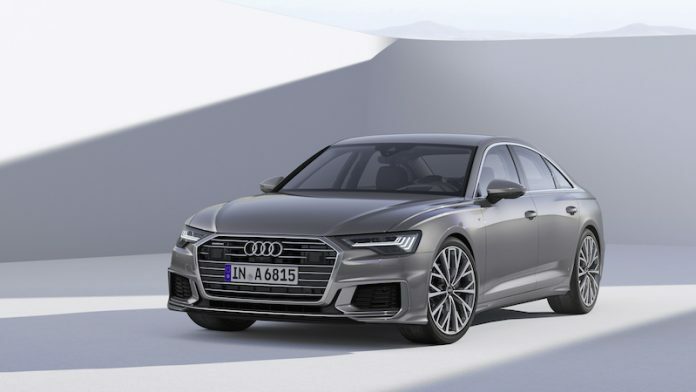 That’s how the new Audi A6 saloon has been described by the German brand as its been revealed to motoring world. Audi states that the new A6 is a car which makes considerable headway in virtually every area according to the brand. 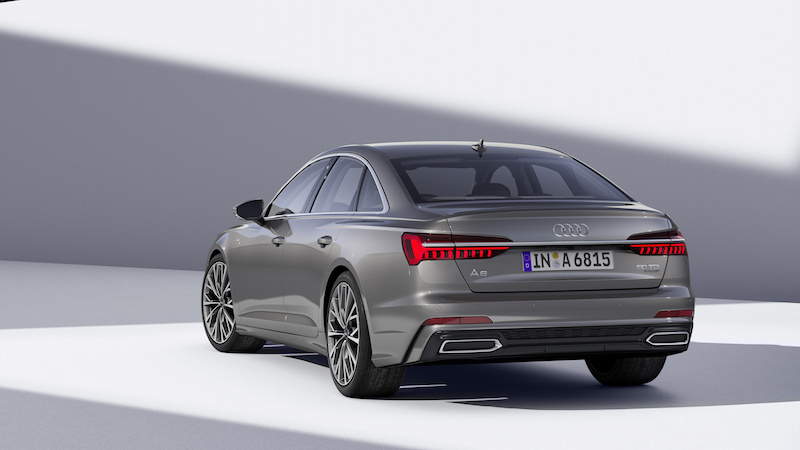 The new model also features tech handed down from the new A8, plus all engines will feature a mild hybrid system too. Now I don’t have any siblings, so I’ve never had to put up with hand-me-downs. but I gather that on the whole, they are normally a bit ropey. There is no such issue for the A6 though, as that has had features down from its larger brother, the A8. This means buyers will be able to enjoy a duo of a 8.8 touchscreen on the dashboard, with a 8.6 touchscreen located in the console in the centre tunnel. The system offers the chance to allow up to 7 drivers to choose their individual settings with up to 400 parameters, therefore you have no excuse to state that’s not enough choice. Speaking of choice, you can choose a larger (10.1″) touchscreen as well as Navigation Plus, which is able to learn routes taken by the driver and then is able to offer suggestions for better routes. The main touchscreen houses the central vehicle operations, which can be moved around in a drag-and-drop functionality – much like a smartphone or tablet. The 8.6 screen is where features such as the climate control can be controlled as well as convenience features and text input. Audi’s wondrous Virtual Cockpit is also available as an optional extra, as is a full colour head up display. Cars like this need to offer a decent amount of room and the A6 looks to be in good stead here. 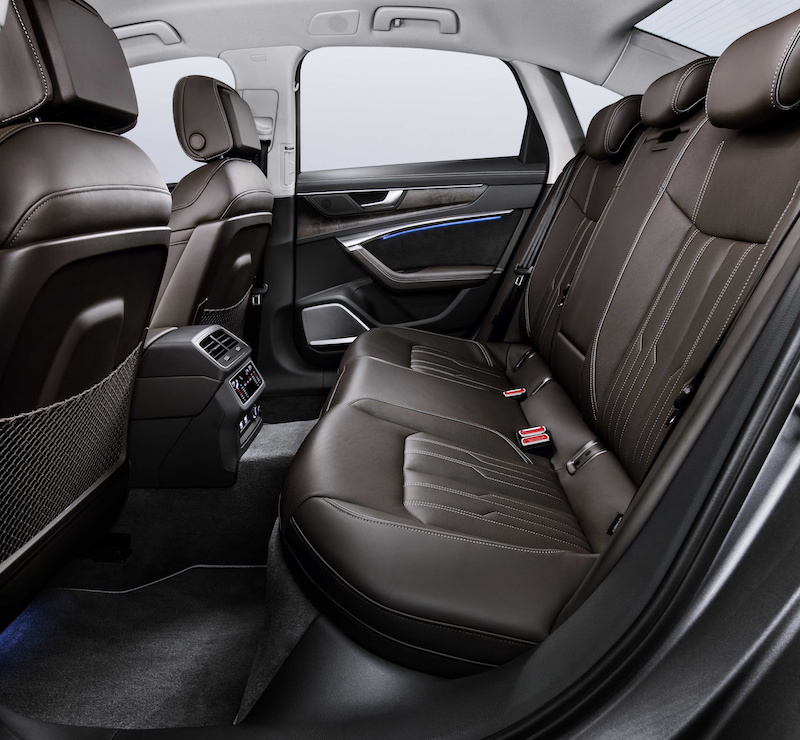 Not only does it offer more shoulder and headroom in both the front and rear compared to the outgoing model, plus it offers the most rear legroom in its class. There will be two engines available from launch – one petrol and one diesel. The petrol offering is a 3.0 litre turbocharged V6, which offers 335bhp with a generous 500Nm of torque. Mated to a 7-speed S Tronic automatic gearbox, the 3.0 litre petrol will hit 62mph in just 5.1 seconds and the top speed is capped at a predictable 155mph. The diesel on the other hand, is 3.0 litre turbocharged unit which offers 282bhp with 620Nm of torque. This engine, however, is mated to an 8-speed tiptronic automatic gearbox, and is able to offer similar performance to the petrol according to Audi. Both engines will be mated to Audi’s quattro all-wheel drive system, and as mentioned earlier, they will have some help from electricity. The belt alternator starter works alongside a lithium-ion battery, which enables the car to cruise at speeds between 34 and 99mph to give better fuel economy, plus is means that the stop-start system us able to kick in earlier – at speeds of 13mph and below. Speaking of economy, the petrol will offer a combined figure of up to 42.1mpg with CO2 emissions between 151g/km and 161g/km. 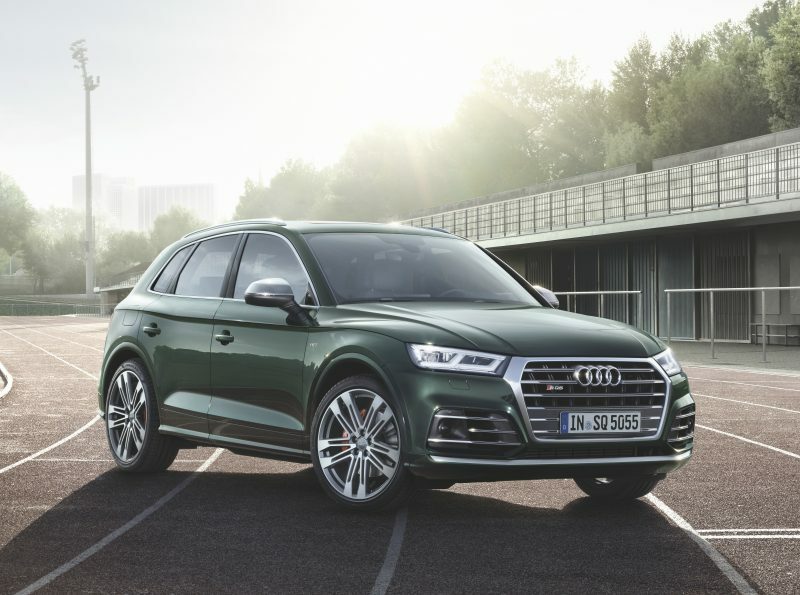 The diesel is able to offer a combined figure of up to 51.3mpg with CO2 emissions between 142g/km and 150g/km. 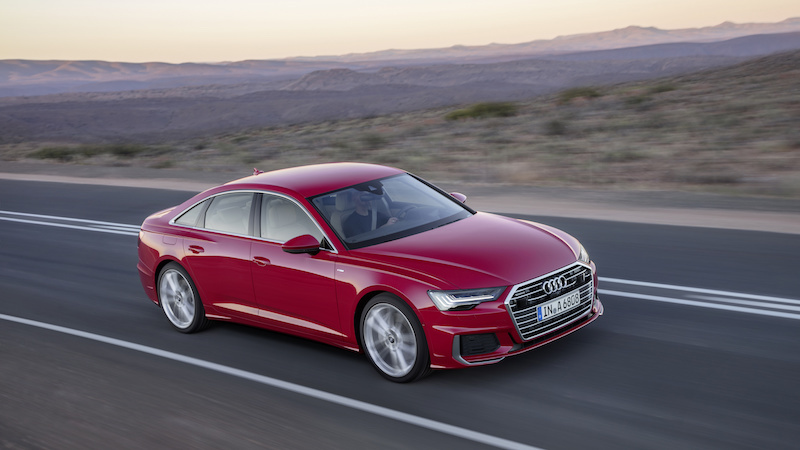 Audi says that the new A6 will have even sharper handling than the previous model, and will be available with no less than four suspension set ups. At the bottom rung of the ladder, you have the conventional steel spring suspension, but for those of you wanting something sportier, there’s the sport suspension. There is also a suspension set up with damper control, and then last but not least, there is the adaptive air suspension for more comfort, and this also has damping control. As well as the new springs, Audi has been fettling with the progressive steering system to make it even quicker, which in turn makes the car more responsive. At lower speeds, the rear wheels will steer the opposite direction, meaning that the turning circle is cut by 1.1 metres. 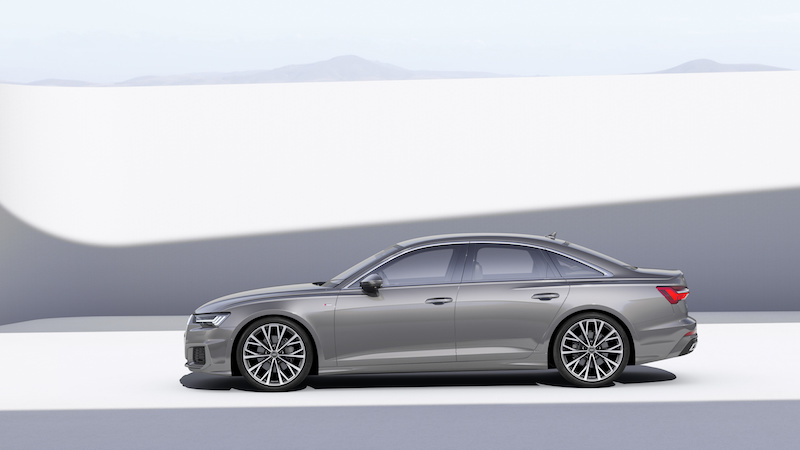 Prices for the new A6 are yet to be confirmed but Audi has confirmed that it will be available to order from the summer.